Does Windows 8 usher in a new dawn? The heavy duty Computex trade fair in Taipei, Taiwan is under starters orders and the biggest noise should turn out to be a new generation of performance tablet computers. The key elements here are the upcoming release of Windows 8, due later this year, and low voltage iterations of Intel's new 22nm Ivy Bridge processors. That's right, I'm talking full-fat Intel Core chips, not those feeble Atom processors. One of the early movers here is Acer with its new Iconia W700 tablet. Until now, the big deal with Windows 8 involved its new touch-optimised Metro interface, which was pinched from Windows Phone, and compatibility with ARM-based chips rather than Intel's x86 CPUs. The thinking was a straight fight against ARM-powered tablets from Apple and the Android horde. That's a contest in which you really wouldn't fancy Microsoft's chances against well-established incumbents. Change the ARM chips to x86 and Intel Atoms and it doesn't look much better. Atom's performance is nothing exceptional and certainly not good enough to usurp proper Intel Core processors. But what if you dump Atom and insert Intel's full-power Core chips? That's exactly what Acer has done with the Iconia W700. Full details haven't been released. All I know for sure is that it's an 11.6-inch Windows 8 tablet with Intel Core rather than Atom CPUs. Very likely it's a new ultra-low voltage dual-core model. Battery life is said to be pitched around eight hours. 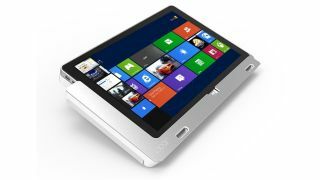 Critically, it's not just a tablet but a full-function PC, squeezed into a tablet form factor. You get the latest Intel 7 Series chipset goodies including USB 3.0, SATA 6Gbps and even Thunderbolt. That's important because it means the Acer Iconia W700 is going to be much more capable that any current tablet. You'll be able to fling large files on and off much more quickly than existing tablets, for instance, or potentially hook it up to external graphics for high end gaming. More importantly, it's a realistic proposition as a dockable device that doubles as not only your laptop, but also your desktop. With a combination of Intel Core processing, solid state storage and those high speed interfaces, it really could be that good. If all those targets are nailed, the final major question mark surrounds Windows 8 itself. How will its touch interface stack up compared to iOS and Android? The pre-release versions of Windows 8 are promising but far from finished. Microsoft has a lot of work to do if it's to compete in a straight fight. Application developers will have their say in this, too. Without compelling apps, Windows 8 will obviously struggle. But here's the thing. When we were talking about Windows 8 for ARM or on Atom, the onus was on Windows 8 to win in a straight fight. Otherwise, why would you choose it? But if we're talking powerful Intel Core-based tablets, it's very different. The one-device-does-it-all proposition might convince users to be a little more forgiving with the details if the overall picture looks good. As for my expectations, I suspect the first generation x86 Windows 8 tablets will be a little too clunky for widespread success. The Acer Iconia W700 certainly looks a bit fat compared to ARM-based tablets. But give it another generation or so in the Intel product cycle and I reckon you'll see full-power x86 tablets match the slim proportions of ARM devices. When that happens, sign me up.